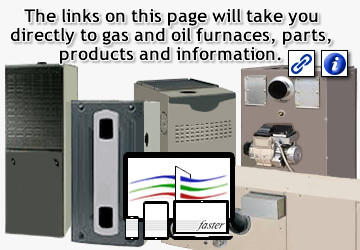 Direct links to gas furnaces, oil furnaces, compatible and OEM replacement parts. Furnace controls, software, thermostats, maintenance and installation accessories and air filters. Everything hot-air furnaces. Gas and oil fired systems, parts, supplies, filters and t'stats. Gas furnaces can be "twinned" to heat larger areas and can be temperature zoned for each room. For any oil furnace to run as efficiently as rated, it needs to be professionally adjusted and tested. This includes CO, smoke, burner fire, O2, pressure and draft. l.p. gas:Liquefied Petroleum gas or Propane gas is used in HVAC as fuel for furnaces and boilers. Most new gas-fired furnaces and boilers can be converted to L.P. Gas. fan/limit switch:A control commonly used in older furnaces to control the cycling of the blower (fan) and exchanger temperature (limit). Newer furnaces use a low voltage control board and separate limit switches and sensors. voltage:Potential difference in a charge between two points in an electrical field. The higher the voltage, the greater the flow of electrical current (amperes). Most home's electrical supply is 120VAC or 120 Volts of Alternating Current. Air conditioning and heat pump systems are 240VAC (2x120VAC). In HVAC systems, high voltage "stepped-down" through a transformer produces low voltage. condensing flue furnace:High efficiency furnace that converts most of its burned fuel for energy in the form of heat. The remainder is converted to condensation and low temperature gases that are expelled through a drain and vent piping. a.f.u.e. :Annual Fuel Utilization Efficiency is a measurement term used in furnaces for the amount of fuel that is converted to energy. Basically, it is a percentage of what burned fuel is used for heat to what is expelled out the vent or chimney. The higher the percentage the higher the efficiency of the unit. hot surface ignitor:Part on a gas furnace used to ignite the pressure regulated fuel as it exits the orifices. The most common ignitors used in gas furnaces are made of silicon carbide and also act as a flame detection sensor after the burners are lit correctly. manual j:A calculation to determine residential heat loss or gain depending on the type of equipment being sized. chimney and vent piping:Piping used to vent flue gases to the exterior of the building. High efficiency furnaces use schedule 40 PVC vent and intake piping. Older furnaces use a heavier gauge metal piping (single or double-walled) to a properly sized chimney flue. Check your local building codes and the furnace's manufacturer's specifications for proper clearances and installation materials. water column (w.c.):A measurement term used for determining the correct operating pressure of L.P. or natural gas that enters and exits the gas valve. Not to be confused with P.S.I. (Pounds per Square Inch). A special tool called a manometer is used to measure the inches of water column a unit needs to correctly operate. diagnostic control board:A low voltage integrated control board on furnaces that will blink a series of fault codes if a problem occurs in the unit's operation. Also called a furnace control or circuit board; not all boards have the fault code output. single or two stage thermostats:A single stage thermostat controls one unit in a single mode like a furnace in 'Heat' mode and the air conditioning system in 'Cool' mode. A two stage or multi-stage thermostat controls variable speed furnaces and air conditioning systems. Not to be confused with a heat pump thermostat which controls the stages between the outdoor heat pump and the indoor electrical kilowatt heaters in 'Heat' mode. An oil furnace can be combined with a heat pump system. This method only uses the furnace in colder temperatures and as a back up to the heat pump. You will also have central air conditioning. This directory contains an index and terms that will guide you to a specific furnace topic or item. This web page focuses on forced hot air gas and oil-fired systems. Oil and gas furnaces are more efficient today then what they use to be just a decade ago. Almost every new furnace is compatible to be used in conjunction with a heat pump or air conditioning system. Furnaces combined with heat pumps are energy efficient, but are an initial cost option to install. But automatically, you will start seeing the savings over having just a furnace for heat, plus the control benefits of having dual systems. Geothermal and solar heating systems are more expensive to install, but are higher in energy efficiency to operate and produce heat.